I have been out taking a very close look and am happy to report that spring is springing. It’s not busting out all over yet, but if you look close, very close – it’s all there to see. Yesterday after work I took a walk with my macro lens. It’s a Leica 45mm f2.8 so I can shoot in overcast conditions or in low light – that pretty much describes the conditions. I love the tonality of evening shots – past the golden hour, but early enough to keep the ISO and noise at low levels. The remains of our glorious autumn are still around. I snapped this by accident, I was not even planning a shot – stupid trigger finger. Sometimes a great lens makes a decent shot out of a misfire. I was beginning to despair. The heat last year did so much damage and until yesterday I saw no buds. They are higher up, I’m hoping they fill in. These are edible and quite tasty in a salad. 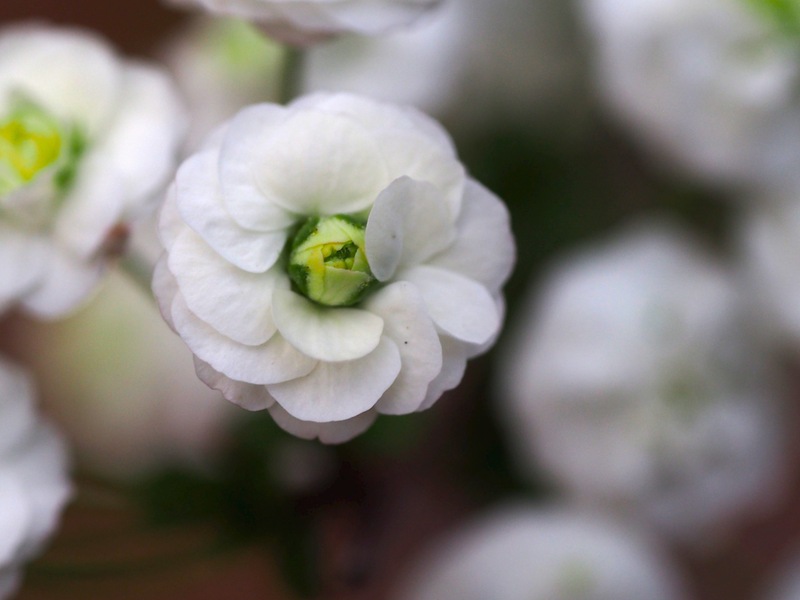 …while this shot focuses on the outer blossoms. 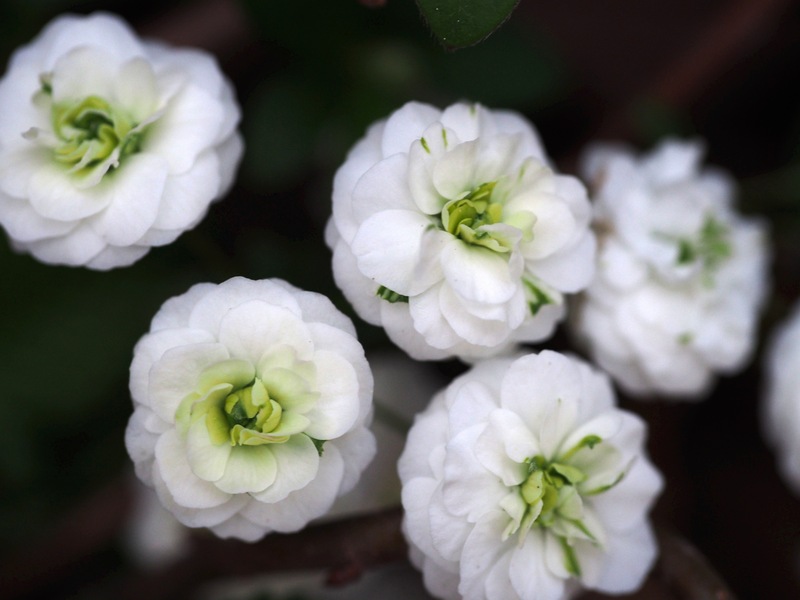 …and resemble very tiny roses. These are tough to shoot because the are on very thin branches that move with any breeze. …another view of the debris from the impact – the breeze makes the lower portion blend together. This is a hole in a large rock I have on the patio – it fills with rainwater and the birds drink from this crystalline cavity. Springtime is about exploration and discovery for me. It’s the perfect time to take that macro lens out for a walk. This entry was posted in birds, Macro Photography, Ozarks, Photography, wildflowers, wildlife and tagged Arkansas, birds, Flowers, macro photography, Olympus, Olympus E-M5, Ozarks, photography, Spring, wildflowers, wildlife by artsifrtsy. Bookmark the permalink. Thanks, I love the colors of spring. It is really great to hear a positive sign that spring is on its way over at your side of the world. The winters are more harsh than where I live, and your spring must be a huge promise of new birth and sunnier days ahead. Enjoy those sunnier warmer days (as we over here slide into the wetter colder darker months). I find it fascinating being able to experience the different seasons via cyberspace in this blogging world. Our autumn is not as majestic as your fall, as most of our trees are evergreen. However, some colonials planted English tree varieties in some areas many years ago and those places do come ablaze, and have started to. I would really like to shoot some reef tanks – I’m gonna have to check into that. Thanks! Thanks – it really is. A macro lens enhances what you can see with your eyes. Every photo is stunning, I could look at your photos all day long. The last two images are my favourites. 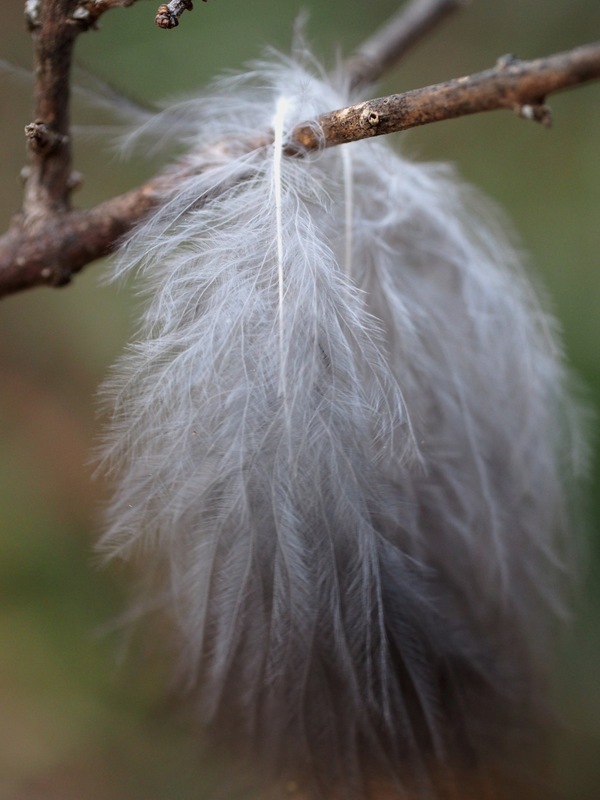 The delicacy of the feathers is magical. 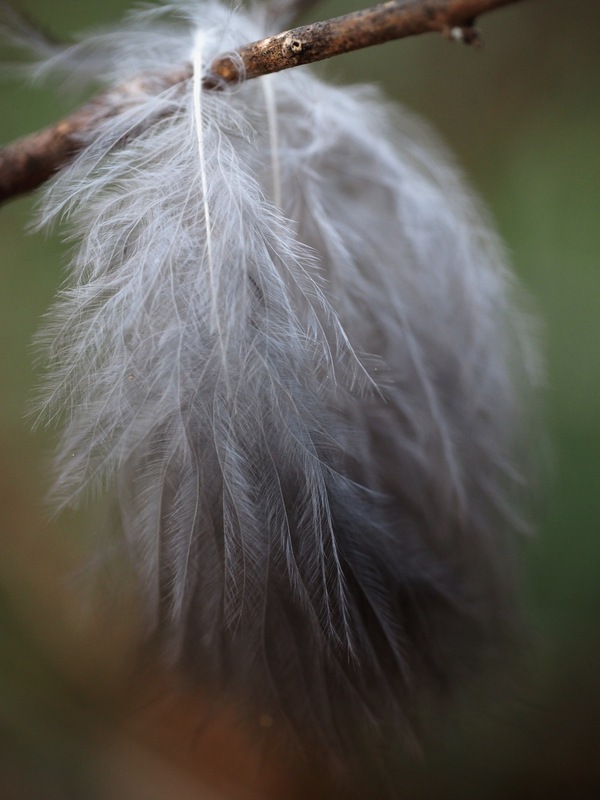 Thanks – those feathers moved so easily in the breeze – I wasn’t sure I could get a good shot. I really love that rock and the fact that the birds drink from it! 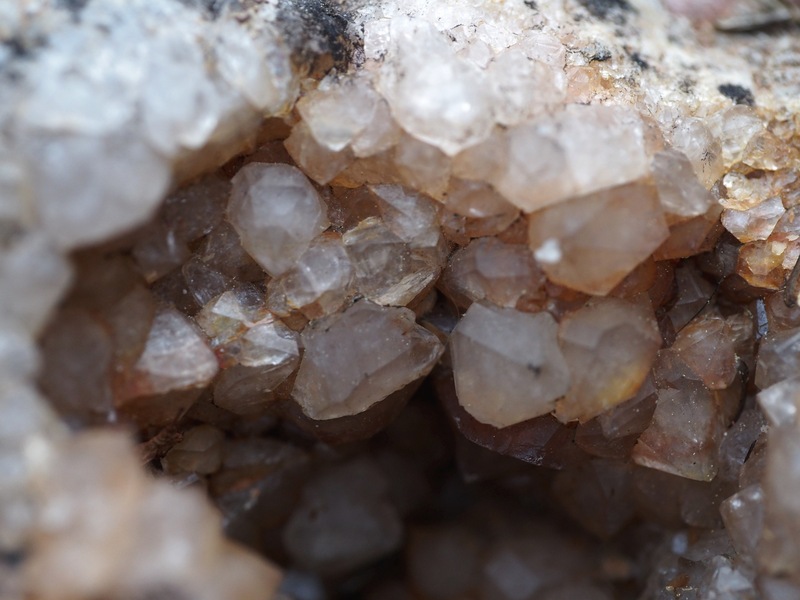 It’s a large rock with a small crystal cave about 2 inches across – it fills with rainwater. The birds love it. 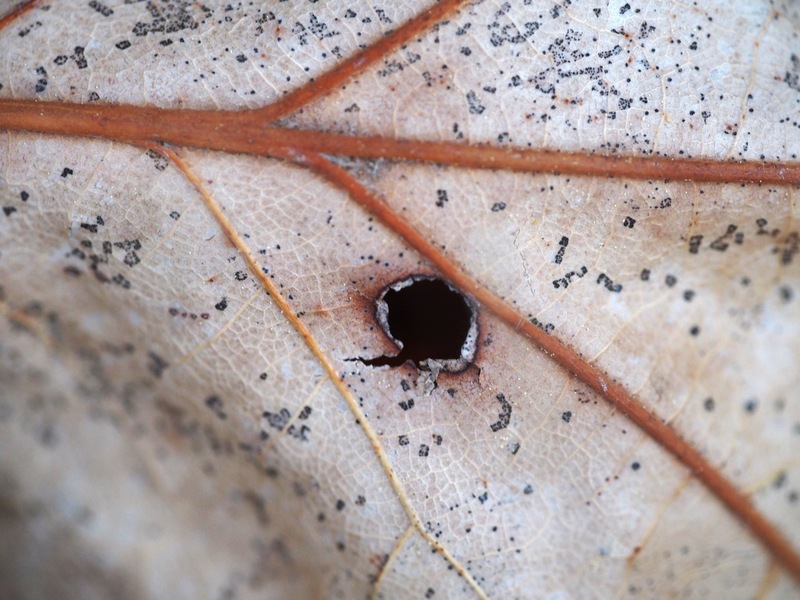 I love the extremes – zoomed right in or macro and you showed why. My favourite is the fourth one zoomed in on the outer blossoms. I do too – I love seeing the detail. I have an old bellows and macro lens from the 70s – the amount of magnification you can get is amazing with that set up – clunky but worth the time. Thanks! 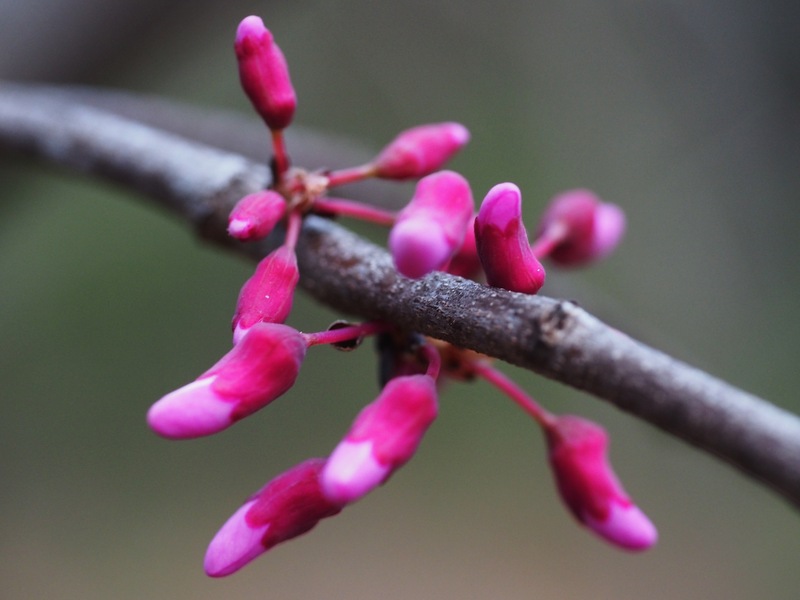 Redbud (Cercis) I rarely hear anyone eating it although it is often been used as medicine. I read an article in the local paper about eating redbuds last year and the next weekend I took a survival class where they recommended them as food to gather in a survival situation. They were pretty good. Thanks for the identifications! liking these very very much! Thank you – happy Tuesday backatcha! Great photos! I got a chuckle out of your post (great minds and all)— I was taking some photos of purple flowers in our yard a few days ago. 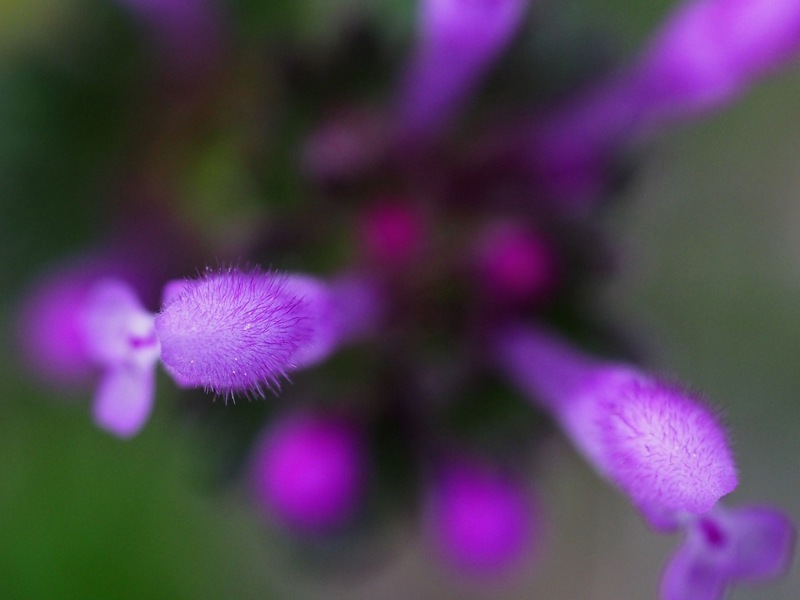 Too funny – turns out mine are weeds – henbit. You should do it. Weeds, now that is funny! That’s about it Bulldog – my macro lens will focus at an inch away. I have yet to get out the bellows and take some manual macros. I did get it fixed but the plumber left a huge gash in my lawn. I have been trying to fill it in by hand but it’s too massive. He told me a couple of rains would “fix it” – Ugh. I’ll get shots of those leaves – the bush is pretty uninteresting once these flowers leave.